A colourist with deep sensitiveness. Vivid colours and contrasting shapes. Pure or upgraded with metal or plaster. Emotion to be found in multiple layers through colour and paint combinations. The painter gives free rein to his emotions. Emotions the viewer may capture or who make him dig in his own sensitive world. A mystery to be solved? Chisin paints emotions relating to his recent past and to the past never to forget, the nightmare of the Holocaust. The sense of beauty - he has expressed from his early age - sparkles in his works. He is fascinated by fashion, more particularly by the aesthetics of the colour palette used by the French designer Christian Lacroix. 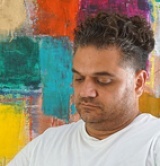 In his view, a sensitive match with the work of his guru, the abstract expressionist Mark Rotko. "I work with mystical colours that have a meaning", says the artist. Chisin, inspired by leaders in the world of fashion and art, chooses colours and paint combinations, often processed in layers, that express his inner experience. He uses the power of colours and complex textures by putting together contrasting and complementing shades to increase the visual effect, reflecting sensitivity. Sensitivity focusing on the strength of being, determination of life as well as fatality of despair. Despite deep feelings of pain, the painter wants to illustrate hope and joy. Colours and mood make a controlled contradiction. Chisin masters the technique of "oil", combined with plaster or metal, and aesthetics in a way he can develop his initial idea of how the work would look like during the painting process to respond to his current feelings. "Works can take up to 4 months to finish. I need to look at the canvas for hours. It brings me fresh inspiration and as long as I am not satisfied, the work is not ready to be seen by others", according to the artist. His emotions rule colour and techniques. The work of Yoram is aesthetically and technically subtle. He makes colours cry and sing! The painter invites the viewer to his inner experience. His work is a communication channel between imagination and reality. He challenges the viewer's sensory experience and cultural background to make his own personal associations. Yoram's believes in the golden triangle of love, of thrusting and of thirst of energy. It stands for learning how to take a new lease of life, how to look at things and how to savour life, ...Therefore in his philosophical quest he focuses on common subjects to better hide in another world - after the sudden death of his wife - to question himself about his intimacy and to stimulate the viewer to question the questioning. The viewer can enter the world of the artist guided by his own emotions and experience because the language of pain, sadness, joy and hope is a universal one. Yoram Chisin, born in 1971 in France (Toulouse), arrived in 1973 in Israel. The presence of his maternal grandmother, a hard and elegant lady, an intellectual who survived the concentration camps, left on him an indelible mark of the nightmare of the Holocaust and so did also his paternal grandfather. His father, the ever-present brilliant man, university professor in medicine, a leftist intellectual was always a reference point from whom Chisin had to escape. Freudian tensions seem clear. He served the Israeli Army Forces in the "Golani" Infantry Division. Today Chisin lives and works in Israel. He recently exhibited at galleries in Sydney, Melbourne, Miami, New York, Tel Aviv, Brussels and Antwerp. Mark Gallery, in collaboration with Lichtundfire, is pleased to present BREATH OF DUST, an exhibition of abstract mixed-media paintings by French born Israeli artist Yoram Chisin. Chisin's visceral surfaces of color, texture and materials radiate, and resonate, and trigger immediate and intentional mixed emotions. Combining a colorful, bold palette with raw and strong texture- an amalgamate of oil paint, and non-traditional art materials such as plaster, metal and burlap- Chisin's tour-de-force takes the viewer through an abundance of abstract detail to arrive at a place that seems to leave us deliberately emotionally unsettled, spent- and apparently with no relief in sight. Deeply rooted in abstraction, and clearly relaying a kinship with Color Field painters and Abstract Expressionists, Chisin's work bears its own vocabulary- defined by Chisin's individual experience and emotions- and sourced by his very personal story. BREATH OF DUST connotes his experience while in the service of the Israeli Army in the early 90's, at thattime, South Lebanon in the Gaza Strip - the memory of how he walked in the desert behind Israeli tanks, completely covered in dust, and reminiscent of his white powdered, camouflaged face, for the purpose of concealment and protection. Beneath the surface of colors and materials, Chisin's work conveys deeply personal events: the premature loss of Chisin's own wife to cancer, his Jewish family's history- forever fundamentally changed by the Holocaust- a story of defiance and renewal. Chisin's paintings, as cheerful, dynamic and colorful they may seem- stem from a very intimate, personal place of memory, pain and transformation- that reaches far beyond the surface and much into the realm of a shared and universal human experience. Yoram Chisin was born in 1971 in Toulouse, France, and moved in 1973, at the age of two, to Israel. He served in the Israeli Army Forces in the "Golani" Infantry Division in 1991. Wednesday through Saturday noon - 6 pm, & Sunday 1 - 6 pm.